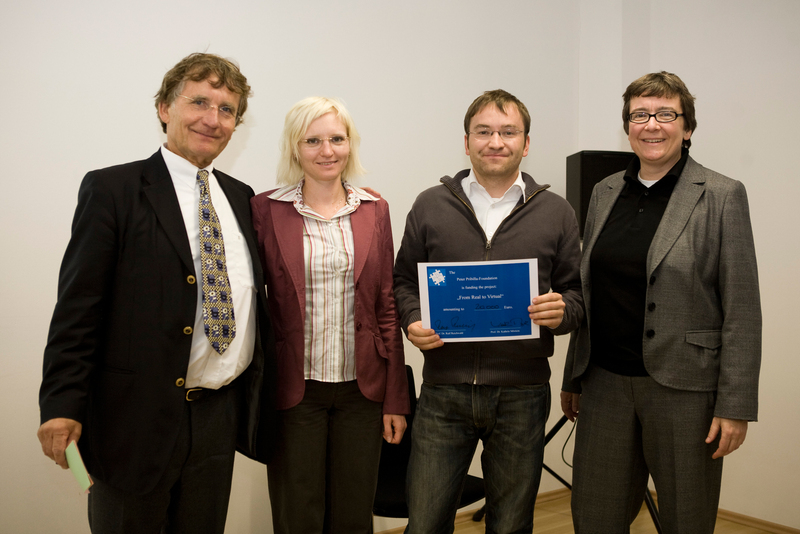 Together with Dr. Anna Trifilova from the Nizhny Novgorod Architecture & Civil Engineering State University, Russia, Dr. Jan Hendrik Schumann from the Technische Universität München (Lehrstuhl für Dienstleistungs- und Technologiemarketing) and our Metor Dr. Bettina von Stamm from the Innovation Leadership Forum we recently started the project “From Real to Virtual”. Before we explain the aim of the project and its possible outcomes we are happy to announce that the project is generously financially supported by the Peter-Pribilla Foundation. The picture shows Prof. Dr. Prof. h.c. Dr. h.c. Ralf Reichwald, chairman of the board of the Peter-Pribilla Foundation and Prof. Dr. Kathrin Möslein, board member of the Peter-Pribilla Foundation, when awarding the commitment of the Peter-Pribilla Foundation to the project team (Anna Trifilova and Alexander Richter; missing Jan Hendrik Schumann and Bettina von Stamm). The aim of the project ‘From Real to Virtual’ is to support the translation of insights from face-to-face meetings, such as a workshops, into a virtual format so that the insights can be shared, developed further and acted upon by a wider community, be it inside organizations or among customers across dispersed geographical locations. The ambition of the project is to enable further exploration and continuation of face to face encounters by placing their essence into the virtual realm where it can be picked up by (a) a much larger number of participants and (b) across much wider spatial/geographical distribution. The solution developed will support this by facilitating a transfer of the created insights into the virtual world. By doing so, this project will enable the shift from the rather synchronous idea generation process – mostly taking part in the real world – to the rather asynchronous innovation management process – mostly taking part in the virtual world. A very important factor to be taken into consideration in the transfer from real to virtual is the influence of different cultures, be it at the organisational, industry or national level. Thus, in the project we will try to enhance our understanding of the influence of culture (a) when moving from insight or idea to enactment or implementation (b) transferring ideas and insights from the real to the virtual world and (c) sharing insights and ideas generated in a small community with a larger audience, which is often unknown in its diversity. As a concrete scenario to explore and pilot the transfer from real to virtual we will use the “Future of Innovation (FoI) Toolkit”, a toolkit that allows organisations to explore a variety of aspects they need to understand, address and be ready for in order to create a successful future of innovation. The FoI Toolkit, currently under development, is building on a book of the same title. The fact that the toolkit is still under development means that it can benefit from and be adjusted to the learnings gained from the cross-disciplinary project. To create awareness, interest and collect feedback ongoing progress and interesting insights will be shared via the project platform and via the Innovation Lab platform. Dieser Beitrag wurde am Wednesday, 17. November 2010 um 1.49 pm veröffentlich. Sie können Kommentare und Antworten auf diesen Beitrag über den RSS 2.0 Feed abonnieren. Sie können einen Kommentar/eine Antwort schreiben, oder einen Trackback von Ihrer eigenen Seite setzen.